With two successful editions Samvad no longer needs any introduction. The laurels that Samvad has been showered have proved that it has the potential to stand out amongst the likes of college magazines. The month of April was significant for all MBA graduates. While few of the First years had their examinations, others were making a mark in the corporate world for the first time as interns. The seniors meanwhile were enjoying their last month as students. Amidst tearful goodbyes, some were preparing for their last exams while others had already begun to get accustomed to the fast pace of the working world. And yet, Samvad managed to attract quite a few ideas for this month’s issue on ‘Innovation’. And these articles were not only new and refreshing but also brought the creative spark in the authors. We were energized after reading these articles and hope our readers also enjoy the articles with equal vigor. Our section WeCare talks about ‘iKheti’ – an innovative business propostition which our fellow Welingkarites have come up with.The concept of iKheti is to be the one stop shop for customized services and specialized products to promote sustainable urban farming. The articles for this month include ‘Samsung against Apple:Innovation Challenged’, ‘The Conundrum’, and ‘Employee Onboarding Redesigned’ among many others. 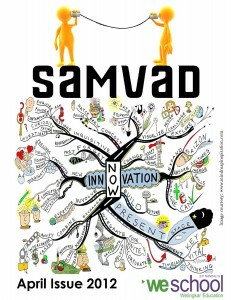 For the May 2012 edition of Samvad, we are inviting articles from all domains – Marketing, Finance, Operations and Human Resources. The theme for the edition is ‘Leadership’. Please send in your entries to samvad.we@gmail.com. Refer to pg. “43” of the magazine for further details. Also, do visit our Facebook page: Samvad: WeSchool Student Magazine and be a part of Samvad. We would like to thank all our readers for their contributions and support. Click here to read the April edition of Samvad. Click here to download the April edition of Samvad.